As I have now studied the Gettier problem for some time (3 years) and will not continue to go on with it, let me resume my experiences in three short statements. I did not make the experience that analytic philosophers (at least here in Austria) liked to discuss the Gettier problem with me. This may be due to the fact that the Gettier problem has been discussed within Analytic philosophy for already more than 50 years, and they are fed up with it. It may also have to do something with the fact that the Gettier problem is not exactly a glory for Analytic Philosophy, but rather the opposite. Anyway, it did not seem to me that analytic philosophers were pleased that somebody with a different philosophical orientation showed interest in one of their theoretical problems. Being an analytic philosopher seems to be very much a question of intuitions; and if one does not share their basic intuitions it is not possible to join their group. For example, I do not share their intuition that in Gettier problems the truth condition is fulfilled. (The truth condition is fulfilled only if the analysis of Gettier cases is narrowed down to the literal meaning of propositions, but not if the intended meaning of the persons who utter those sentences is taken into account.) However, there was no way for me to discuss that issue with analytic philosophers, they just were not interested in it. This phenomenon may be problematical, for if it is necessary to share the intuitions of analytic philosophers in order to enter a career in academia, then becoming a philosopher is not so much a question of rationality but of joining a group of quasi-religious believers (the group sharing analytic intuitions). The analytic philosophers I have discussed the Gettier problem with did not accept any other method of analysis of it than their own. Their own method consists in inserting the propositions generated by the specific Gettier case into the equation of the so called Standard Analysis of Knowledge. As I, with my background in Phenomenology, came up with my phenomenological method I did not encounter any understanding of its relevance for the Gettier problem from the side of analytic philosophers. In my paper „What we can learn from the Gettier problem about knowledge. And what follows from that concerning the possibility of patient knowledge” I have tried to show that the emphasis on the aspect of truth within the concept of knowledge leads to a decrease of self-confidence in weaker epistemic subjects and, consequentially, has a disempowering effect on them. The argumentation is divided into two parts: in the first part the situation of the individual subject of knowledge is considered, in the second part the social dimension is added. The Standard Analysis of Knowledge and the Gettier problem sketch the problem of knowledge on the level of an individual subject of knowledge knowing one specific proposition (one sentence). On this level I focus on the fact that all Gettier cases omit the question who supplies us with the information about the truth. We are, for example, told that a person sees a sheep in a field and forms the belief that there is a sheep in the field (the proposition in question), but that this sheep is in reality a dog that looks like a sheep. However, behind a little hill in the same field there actually is a real sheep that makes the proposition “There is a sheep in the field.” true. In such a case I, as a phenomenological philosopher, would now be interested in knowing the person who brings the news about the real sheep behind the hill, and I would like to ask her under which circumstances she saw it and if she made sure that it really was a sheep. However, analytic philosophers do not have any problem with the concept of a truth that is not noticed and communicated by anybody. This is why in Gettier cases the truth is just told by the auctorial storyteller, and we have to accept that there is a real sheep behind the hill although this information somehow pops out from nowhere. In my paper I have used this “magic” in the Gettier problem (that we do not know the source from which the knowledge about the truth is provided from) in order to question another central intuition of analytic philosophers, namely the intuition that in order to call something “knowledge” the content of what we know has to be true. In my opinion (and following my intuition), if we say that we “know” something we just want to say that we are quite sure about it, but not that we are 100% sure about it. Because otherwise we could not err. Confusing knowledge with absolute knowledge and with the fact that we also know for sure that we know a specific proposition is hubris. 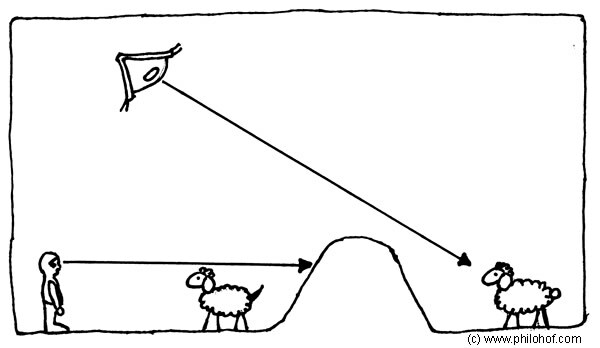 In my paper I have visualized this hubris by a God’s eye that is suspended above the hill and able to see the real sheep hiding behind the hill. By believing in the Standard Analysis of Knowledge, that is, in the claim that knowledge is (a) believing a proposition which is (b) true and (c) being justified in believing that proposition, we are kind of playing to be God for the truth condition in my opinion is too strong for knowledge. Therefore, there is something wrong already in the Standard Analysis of Knowledge, namely the truth condition, and the Gettier problem just shows this mistake by construing a fold into reality which in this case is represented by the hill that separates the spectator from the sheep. In the original Gettier cases this “reality fold” is built by the unpredictability of the future and by great geographic distance. It can thus be deduced that persons who have the intuition that something they know is really true (because otherwise they would not know it) are people who are very sure of themselves. They are know-alls, people suffering from the mania of always being right. The phenomenological method actually shows that by indicating to the fact that in Gettier cases it would be necessary for them to use God’s eye in order to conceive the truth. In the second part of my paper I have added the social dimension to this basic situation. The argumentation goes as follows: We, human beings, are not gods, but we are experts and lay-persons, stronger epistemic beings (healthy persons, grown-ups, professors) and weaker epistemic beings (ill persons, children, students), and an expert looks like a god in comparison to a lay-person. The truth condition of the Standard Analysis of Knowledge therefore is a good criterion for knowledge if the goal is the defence of the established social order. The expert, as a person who is busy all day long in her narrow field of specialization, will always be able to prove to the lay-person that the lay-person does not know anything about a specific topic because she does not know as much about it as the expert. However, if the goal is to empower the weaker epistemic subject, as is case e.g. 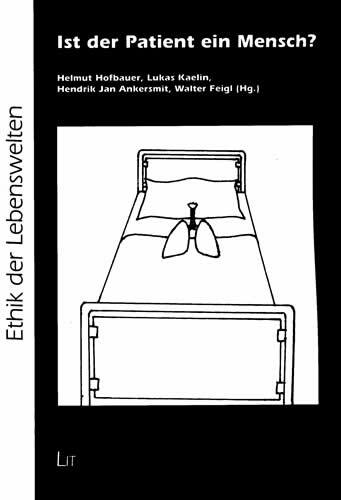 in patient knowledge, the truth condition is too ambitious: From the expert point of view the ideas of a lay-person and, even more, of a chronically ill person suffering from pain and shortness of breath, must inevitably appear to be irresponsible. Therefore, in order to make something like patient knowledge possible – that is: to establish knowledge of weaker epistemic subjects – knowledge would have to be defined differently than in the Standard Analysis of Knowledge. The truth condition which is only useful for the search of mistakes committed by weaker epistemic subjects in order to make them ashamed of themselves would have to be substituted by one or more other condition(s). Possible candidates are: whether additional knowledge about their illness enables patients to change their behaviour, whether it adds up to their already existing knowledge, whether it empowers them to get along alone for longer periods without panicking and rushing for expert’s advice, whether it improves their self-confidence, and so on. In summary, the intuition shared by analytic philosophers (and they claim that this intuition represents common sense) that something we know has to be true in order for us to know it, is only true for over-self-confident people, for know-alls and dogmatics. Patient knowledge construed after the model of this intuition will result in permanent control of patients by doctors via technical devices like cell phones. The reason for that is that is appears irresponsible to let somebody alone who knows less than you do (that is: who is not right all the time, at least according to your own standard). The situation would be different if we ventured to define knowledge as the ability of a person to get along by herself – and only in then something like patient knowledge would be possible. However, in this case we would have to renounce from our tendency of judging this person every time she commits an error. For the knowledge of an autonomous person is not judged by the truth condition of the Standard Analysis of Knowledge but by her ability to get along by herself.